TFGZJ Roller Compactor is a novel one-step granulating machine, which can directly press, form, roughly pulverize, and granulate the raw material powder, based on the mechanical press principle using material’s crystal water, and this method is energy saving, easy operation and cost reducing to granulating continuously. Pour the dry mixed medicine powder with certain crystal water into the taper hopper, make pre-pressure by the rotating feeding of special unequally spaced taper screw to press the material, eliminate air and disperse the material evenly in the surface of two rollers, then press it to thin tablet by two rollers with press thrust, and cut it then granulate in granulating cylinder. 1) Reasonable design of feeding hole, hand feeding/auto vacuum feeding, and equipped with material level detecting device. 2) Air sealing equipment is applied in all rotated axes. 3) Vertical screw special unequally spaced and taper feeding device is applied. 4) Water cycle cooling of roller can apply normal water cooling or freezing water or mechanical freezing water cooling. 6) Zero worn design of side sealing. 7) Closed-type driving for the roller. 8) Reasonable design of lubricating system. 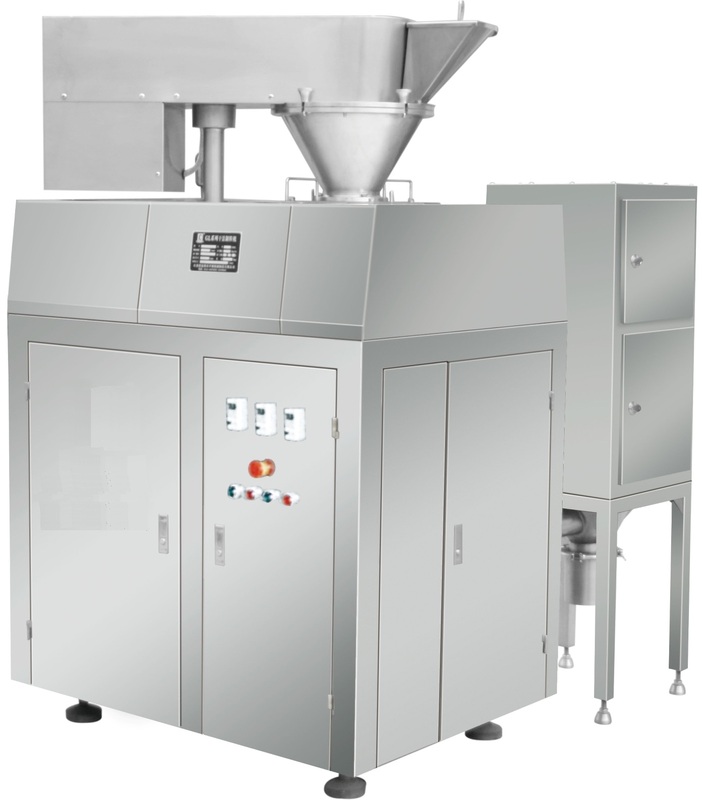 9) Advanced and reasonable design of granule forming system. 10) Reasonable design of hydraulic pressure system. 11) PLC control/ PID auto track to control speed automatically. 12) It is simple and easy to clean and disassemble the whole machine, the structure design of sealing in and out of the machine cover is reasonable. 13) Comply with GMP requirements completely. The main part of the machine is stainless steel 304.